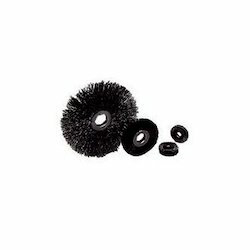 Our range of products include gold wire wheel brush, crimped wheel brush, nylon abrasive wheel brush, wire wheel brush, power brush and nylon wheel brush. 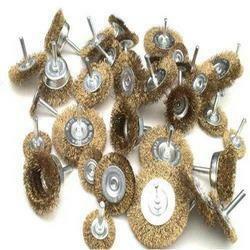 Gold Wire Wheel Brush of crimped wire with suitable keyway in stainless steel wire , carbon steel wire, nylon wire in various sizes. The offered wheels are sourced from most authentic vendors in the market and are precisely engineered using supreme grade metal and ultra-modern tools in compliance with set industry norms. We offer these wheels in number of sizes and designs in order to meet vast necessities of our valuable clients. 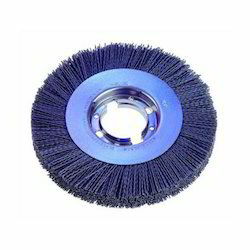 Backed by highly enthusiastic teams, we are involved in offering qualitative array of Crimped Wheel Brush at market leading rates. Our professionals make use of top-notch quality material for designing these brushes as per the international quality standards. 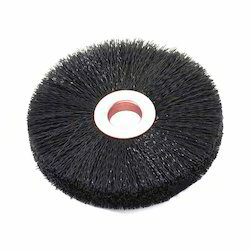 Offered brushes are widely used for cleaning floors at various places. The offered brushes can also be customized as per the information n given by customers. Brush dia 20 mm to 60 mm. 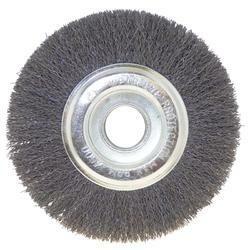 We are the leading name in manufacturing and supplying a vast quality range of Nylon Abrasive Wheel Brush. These quality product range are fabricated by using superior quality of raw material. Our product range are highly appreciated and as per industry standards. 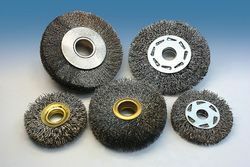 Wire Wheel Brush crimped wire wheel brush are filled with steel and stainless steel wire in a variety of gages for application form aggressive material removal and deburring to surface conditioning and polishing Arbor homes are easily adapted to any spindle or drive arbor with adapters. Ideal for buffing, cleaning, light deburring, flash removal surface finishing, polishing , paint & varnish removing, rest & oxide , weld preparation, weld cleaning and much more. Power Brush offered comprise high performance based power brush options. Wire Wheel Brush of crimped wire with suitable keyway in stainless steel wire , carbon steel wire, nylon wire in various sizes. The offered wheels are sourced from most authentic vendors in the market and are precisely engineered using supreme grade metal and ultra-modern tools in compliance with set industry norms. We offer these wheels in number of sizes and designs in order to meet vast necessities of our valuable clients.